National Institute of Psychology . Quaid-i-Azam University, Islamabad (Pakistan) . 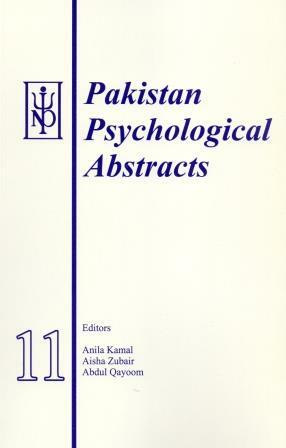 Pakistan Psychological Abstracts is a serial publication of the National Institute of Psychology, Quaid-i-Azam University, Islamabad. It is meant to provide non-evaluative summaries of articles, research monographs (published or unpublished), books, and theses related to psychology. Only the material published in Pakistan, or in case of unpublished research or dissertation, work carried out in Pakistan and not published outside is included. Material published outside Pakistan is not included in this collection, even if the research has been carried out in Pakistan or by Pakistani authors. Articles published in popular journals, popular books, and text books are also not included. The contents can be broadly classified into three groups. This classification is indicated by the number and letter combination given in the beginning of each abstract. The prefix ’11’ with each abstract of this issue denotes the year of this volume. The last figure is the serial number of the abstract. The letter in the middle indicates the type of material being abstracted. The following is the list of codes. J Articles published in a professional journal. A Articles in the proceedings of the conferences of academic organizations or in edited books. M Research monographs, including unpublished manuscript. B Books (authored) other than textbooks and popular psychology books. If an article based on a thesis has been published then both the thesis and the article will be abstracted in the relevant portions. However, if the complete thesis is published, then it will be treated as a book. All abstracted material being presented in this volume is available in the Library of National Institute of Psychology.